Since the beginning of January both of my books and all my disks have been showing as out of stock on this website. This is because I was away on an extended vacation. Now I am back and everything is back in stock and I will be sending out orders as quickly as I can. Here is a reminder of what I have on offer. 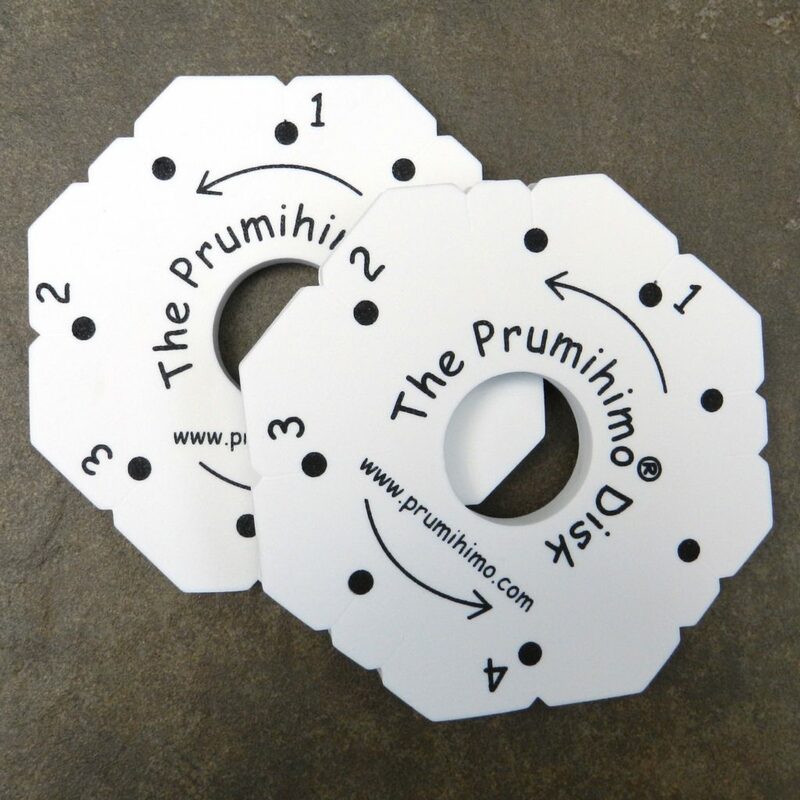 The Prumihimo Disk. This is my own development which I first produced in 2015. I worked out my own system of slots, dots and numbers to guide the braider through the steps of a traditional braid structure. The braid allows beads to be positioned along the sides of the braid in straight rows, which is particularly useful for jewellery making because it opens up a wide range of different bead shapes, which had not previously been used widely in kumihimo. The disk is available in the regular 1cm thickness or the extra-thick 2cm version. They can be bought singly or in multiples to make the best use of the shipping charge. The disk is protected by design patent and design protection in 29 countries. 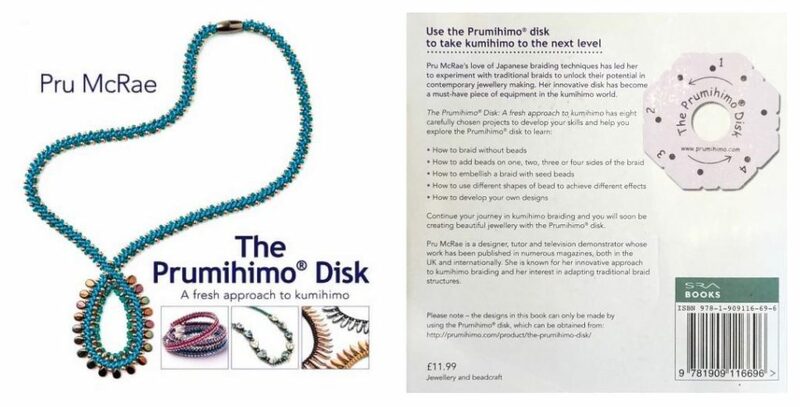 Book – The Prumihimo Disk – A fresh approach to kumihimo. My first book was published in 2016 as a handbook to the Prumihimo disk. It is a concise, yet comprehensive guide in a compact format. My aim was to ensure that readers would be able to get the most out of their disk. There are 8 carefully selected projects designed to teach the main applications of the disk. It is filled with inspirational images of braids snaking through the pages to encourage the reader to explore the potential of the disk. It is sold either with one disk or with 3. It can also be purchased with the second book. 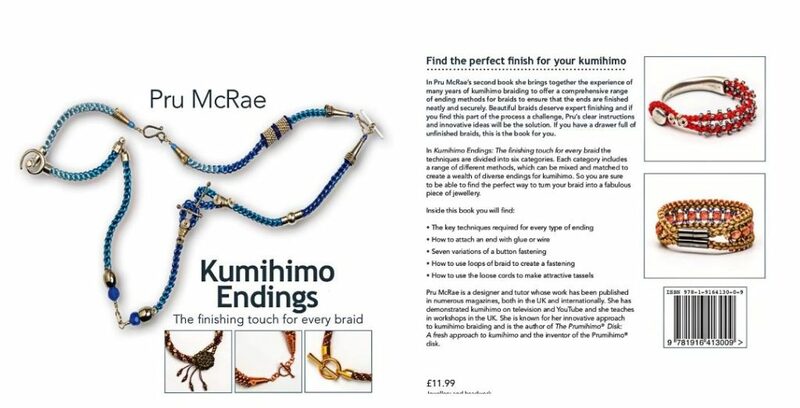 Book – Kumihimo Endings – The finishing touch for every braid. This book was written in response to the numerous requests for help with the ending process. I have written six chapters of different ending methods, ranging from simple glue-ins to some very creative loop or tassel endings. The chapter on button fastenings has no less than 7 different structures, with a mix and match element offering many more variations. The format is the same compact size which proved so popular with my first book. It can be purchased alone or with the first book. If you are interested in any of these products, or in any of my downloadable tutorials, please visit the shop on this website.